If you’re headed home for the holidays, consider brushing up your axel and lutz. Several Appalachian and near-Appalachian cities have recently opened outdoor ice-skating rinks in their central downtown areas, channeling the urban spirit of New York’s Rockefeller Center. Greenville, S.C. and Lexington, Ky., opened rinks this November for the first time. Knoxville’s Holidays on Ice has been in Market Square since the mid-2000s, and a rink opened in Pittsburgh’s PPG Place in 2001. While ice-skating is quintessential wintery fun, it also represents a movement by city leaders toward creating public spaces that are active, engaging destinations even in the coldest months. 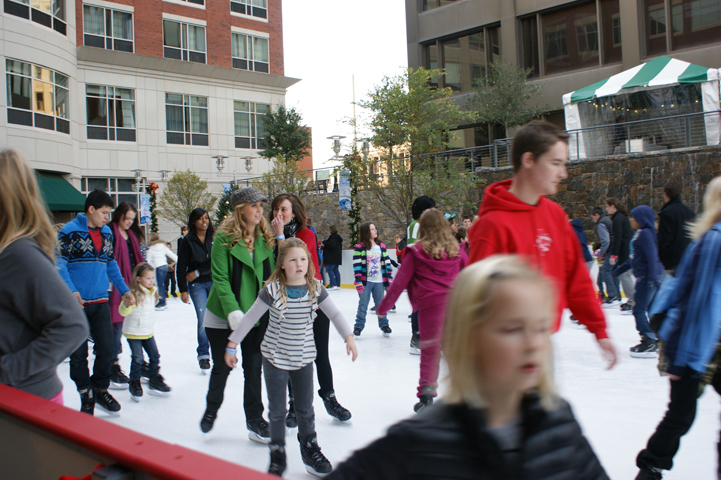 Dana Souza, parks and recreation director for the city of Greenville, said Ice on Main, a 3,200 square foot rink surrounded by a hotel, city hall, offices and restaurants, is indicative of the city’s values. 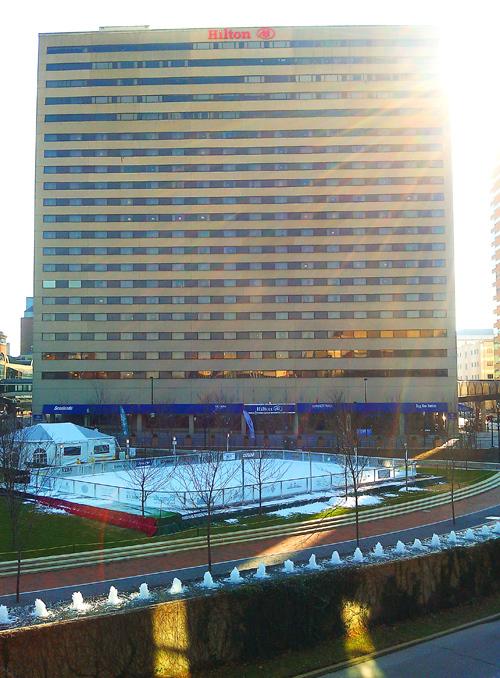 He said that when a Courtyard by Marriott was built last year, the city envisioned using its neighboring green space for the ice rink. About $125,000 was raised to build and maintain the project. There is a waterfall fountain on site, as well as the city’s Christmas tree. It’s pleasant for spectators as well as skaters, he said. The rink drew 5,000 people for its Thanksgiving opening weekend and has made about $50,000 so far. Richard Breen, media relations director with Crawford Strategy, the public relations firm for Ice on Main, said that in the 1960s and 70s, Greenville’s downtown, like so many other cities, was dying. City fathers decided to try to breathe life back into the city center with a series of projects, he said, such as the Peace Center for Performing Arts; RiverPlace, a high-end residential community on Reedy River; and Fluor Field, a minor league baseball field. The idea was to expand the central business district’s footprint, he said. There’s been a real effort to create attractions that get people walking around and investing substantial time there, rather than people driving into the district, then driving away, he said. “This was seen as another amenity to get people excited about downtown Greenville,” he said. 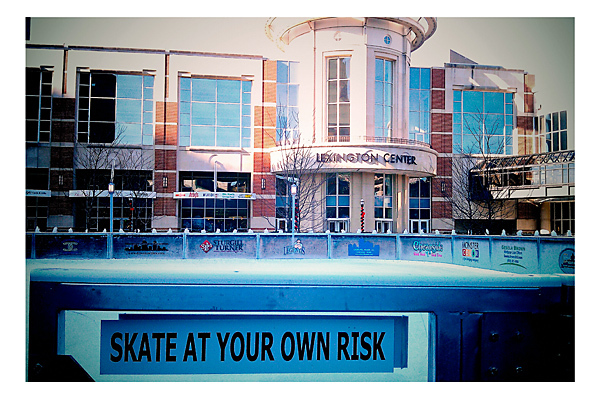 It’s a sentiment that’s echoed as well around Lexington’s new ice skating rink in Triangle Park, in front of the city’s Civic Center and Rupp Arena. The ice rink is one of a host of changes planned for the park, including an outdoor cafe and activities area for chess, backgammon, ping-pong and croquet. The Triangle Park Foundation worked with Project for Public Spaces, a New York-based nonprofit, to make the park, which was mostly green space, less passive.